“Mesmerizing... explosive... intelligent... he belongs on the world stage” (Salt Lake Tribune). 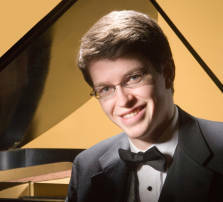 American pianist Stephen Beus is recognized as one of the most promising pianists of his generation. In the space of four months, Mr. Beus won first prize in the 2006 Gina Bachauer International Piano Competition, first place in the Vendome Prize International Competition (Lisbon) and he was awarded the Max I. Allen Fellowship of the American Pianists Association (Indianapolis). In 2008, Mr. Beus made his Carnegie Hall debut performing Prokofiev Concerto No. 3 with the Juilliard Orchestra. He has also performed as guest soloist with the Gulbenkian Symphony (Lisbon), the Tivoli Symphony (Copenhagen), the Northwest Sinfonietta (Seattle), the Royal Philharonic of Morocco (Casablanca), the Vaasa Symphony Orchestra (Finland) as well as with the Indianapolis, Utah, Fort Worth, Tucson, Yakima, Bellevue, Salt Lake, and Walla Walla Symphonies. Equally active as a soloist, Mr. Beus has performed in the Salle Gaveau and Salle Cortot (Paris), Merkin Hall, the Scuola san Rocco (Venice), the Teatro San Carlo (Naples), Carnegie Hall (Weill Recital Hall), the Queluz Palace (Lisbon) and has performed for the Dame Myra Hess and Fazioli Salon series (Chicago), the International Keyboard Institute and Festival (New York City) and has given recitals across the United States as well as in Kazakhstan, Russia, Finland, Switzerland, Germany and Morocco. The fourth of eight children, Mr. Beus was born and raised in Othello, WA and started lessons at age five. Four years later he made his orchestral debut playing Mozart’s Concerto K. 488. Mr. Beus holds degrees from Whitman College and The Juilliard School where his teachers have included Leonard Richter and Robert McDonald. He has recorded on the Endeavor Classics and Harmonia Mundi labels. For more details, visit www.stephenbeus.com.